I'm a big fan of Google's Data Liberation team and many of the posts from this blog showed how to export data from a Google account. The first notable project of the Data Liberation team was Google Blog Converters, a way to migrate the posts and comments from a blogging service to a different service ("the initial release provides Python libraries and runnable scripts that convert between the export formats of Blogger, LiveJournal, MovableType, and WordPress"). 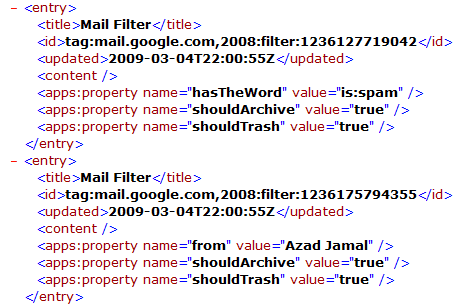 The most recent project is a Gmail Labs feature that lets you import and export filters. "Filter import/export, available today in Gmail Labs, helps you work with filters in bulk, rather than just one at a time. The basic function is simple: turn it on from the Labs tab under Settings, and from the Settings > Filters page you can download a file containing some or all of your filters or upload a file to create a set of filters all in one go." You'll export an XML file that lists your filters. The file can be edited in a text editor like Notepad, using the format described here, with some changes. Hopefully, the Email Settings API will be available to all Gmail users, even as a simplified way of migrating Gmail's settings to a new Gmail or Google Apps account. Assuming that you have a supported browser, go to Gmail Labs, use your browser's find feature (Ctrl+F) to search for "filter import", enable the option and then click on "Save changes" at the bottom of the page. The new feature extends the Filters section from Settings by adding options to export some of the filters or import a file containing filters. Awesome! This is a great way to back these up! Although Google should be backing this stuff up constantly. But, I guess it could be imported into other people's Gmail accounts (if they're getting some of the same type of crapmail). I'd settle for them moving the 'create new filter' button to the top of the page. Regarding the create-filter button at the top of the page: Look closely at the links to the right of the search box at the top of any Gmail page. One of those links says "Create a filter", and that's exactly what it does! And regarding the backups: yes, your filters are extremely safe in Google's hands. But if backing them up yourself will give you peace of mind, now you have a way to do it. Would be good if you can import/export labels - I have a backup account i'd love to import my labels across from my main account. Very nice feature. It even imports the labels if your are using them in your filter actions. Another nice feature would be to apply the filters to old conversations. My highest approval. All these exports are essential to setting up a second [professional] gmail account. All this could only be made better by a one-button-solution to create a second account and move all these settings (contacts, emails, filters, etc.) all in one fell swoop. can i import gmail filer/labels into outlook 2003 . I want to configure my outlook with all gmail labels and filters. is there any way to get these filtered mails without creating any rules manually in MS Outlook 2003. First of all, you should use IMAP to read Gmail messages in Outlook. Most of Gmail's label-related actions are available if you use IMAP: here's an useful table. Gmail's filters are only applied for incoming messages, so you don't have to worry about creating filters in Outlook. Define the filters in Gmail's web interface and that's all. Great feature! Saved me so much time after migrating to a new gmail account! Old thread, but it has now come out of Labs and is now on the bottom of the Filters page. I have several Filters in MS Outlook 2016, but they only work when Outlook is OPEN. I would MUCH Rather have all of my filtering done by gmail. IS there an EASY way to take my Exported Outlook Filters and simply Import them to gmail?